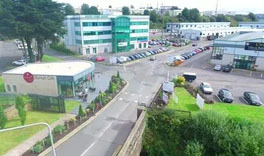 Northpoint Business Park is Cork’s largest business park on the north side of the city and comprises of over 250,000 square feet of light industrial, showroom and office space. Northpoint Business Park offers clients multiple choices with complete flexibility as the units are designed to facilitate the sub division/combination of units. With top quality infrastructure and high standards of design and finish, Northpoint offers effective business operating facilities making it ideal for manufacturing and assembly, warehousing, retail and corporate offices. The design of Northpoint House was focused on one simple principle – ‘the best facilities attract and retain the best people’. A number of office and industrial units are available in Northpoint. Northpoint Business Park is just 10 minutes from Cork City Centre and conveniently located on the North Ring Road (N20). Northpoint is within walking distance to transport links, convenient to retail and restaurant offerings and centrally located for clients and customers. North Point Business Park is Cork’s largest business park on the north side of the city and comprises of over 250,000 square feet of light industrial, showroom and office space.